How Much Does ERP Software Cost: Off-the-shelf vs.
Review and compare the major modules and prices from different ERP vendors. 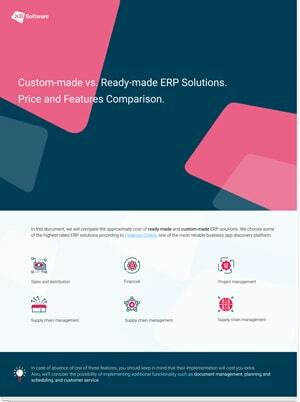 XB Software’s marketing and research team analyzed the data about ERP software solutions and prepared a free to download the report to facilitate your decision making. It compares the information about ready-made and custom-made ERP solutions in terms of applicability and cost. How much an off-the-shelf ERP system will cost you in long-term? What ERP is best for Manufacturing, Retail, Business Services: a COTS system, or a custom ERP? What are the must-have ERP modules for your business? How much will customization cost you? Please fill out the form, and we will send you the download link within seconds. Please keep me updated on relevant news, events and offers.